A 42 year old Asian male patient was referred to the combined diabetic and vascular foot clinic in August 2000. He had a 37 year history of chronic foot ulceration secondary to a peripheral neuropathy. This was initially thought, although not confirmed, to be due to leprosy. 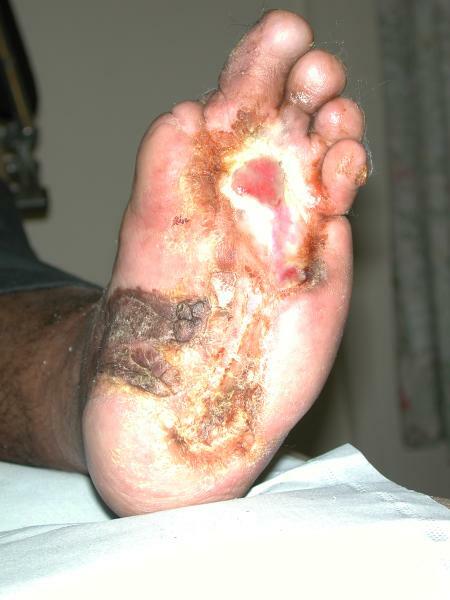 The patient reported that he had previously had 24 attempts at skin grafting, including amputation of the great toe with transfer of the skin to the ulcerated area on the sole of the foot. The last skin graft was performed in 1984 and following failure of these procedures he was offered below-knee amputation. He declined this radical form of treatment, preferring to continue with self-treatment, community and plastic surgical dressings and periodic courses of antibiotics. More recently he had required these at three monthly intervals. On referral to the combined foot clinic, there were two plantar ulcers, one across the metatarsal heads, with a further ulcer towards the heal (Figure 1). Despite intensive conventional management, which included offloading with an Aircast� boot, debridement and a variety of protective dressings, these areas coalesced into a single ulcer measuring 23.6 cm� (Figure 2). Having concluded that this ulcer was unlikely to heal with either further dressings and offloading or another autologous skin graft, we elected to treat the ulcer with a bioengineered skin product, Apligraf�. Following additional wound bed preparation, which on this occasion included the use of hyaluronic acid (Figure 3), we considered the ulcer ready for grafting. The Apligraf was airfreighted from the USA in environmentally stabilised packaging, which provides a shelf-life of five days (Figure 4). We placed two of the 7.5 cm diameter Apligrafs, fenestrated to allow drainage of exudate, onto the wound (Figure 5). The grafts were held in place by a combination of Mepitel�, Lyofoam� and orthopaedic wool, covered with a retention crepe bandage. Initially the patient was managed as an outpatient with complete off-loading, returning to the Aircast� and limited mobilisation after four weeks. At the first major dressing change on day 5 there was already an improvement in the wound with evidence of an advancing healing edge (Figure 6). At 4 weeks (Figure 7) there was a marked reduction in the ulcer size (>50%) and the remainder of the wound appeared healthy with a reduction in hyperkeratinosis and exudate. Rapid healing continued as shown by the images at 6 weeks (Figure 8), 7 weeks (Figure 9) and 8 weeks (Figure 10). The ulcer is now healed (Figure 11) and other than one minor ulcer recurrence six months after healing, the ulcer remains healed. The patient has returned to full mobility in custom-made footwear. It would appear that the use of Apligraf achieved what the patient's own skin had failed to do, namely the resolution of his chronic foot ulcer. Apligraf� is a living human skin equivalent (HSE) consisting of a tissue engineered bi-layered skin equivalent, having both an epidermis and a dermis , . It consists of keratinocytes and fibroblasts derived from neonatal foreskin and bovine collagen. Apligraf has been demonstrated to produce a great number of cytokines and growth factors and is immunologically well tolerated. Although the exact mode of action of HSEs are not known, they appear to act by both filling the wound defect with an extracellular matrix and by producing bio-active chemicals which enhance healing and are produced by normal skin during the healing process. The value of this product in the management of diabetic neuropathic foot ulceration has recently been published , , . It has been suggested that the neonatal origin of cells used in the production of Apligraf may provide the product with an advantage over other skin products and possibly even over autografts. Certainly in this case, where management by conventional grafting techniques had failed repeatedly, the healing of this ulcer following a single application of Apligraf has been remarkable. This case also illustrates the importance of good wound bed preparation (WBP) before the application of either skin or biosynthetic skin substitutes. Preparation of the wound bed included the use of hyaluronic acid, a naturally occurring extracellular matrix component with a variety of functions in wound healing . In particular hyaluronic acid has been shown to enhance angiogenesis , which may have had an important effect on the quality of granulation tissue and the subsequent effectiveness of grafting in this case. The aspects of good wound care as they relate to the concept of WBP have recently been discussed . This case would suggest that appropriate WBP is necessary if scarce or expensive resources are to be used effectively. 1. Trent JF, Kirsner RS. 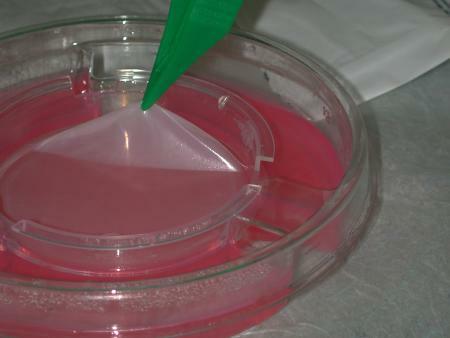 Tissue engineered skin: Apligraf, a bi-layered living skin equivalent. Int J Clin Pract 1998; 52(6): 408-13. 2. Eaglstein WH, Falanga V. Tissue engineering and the development of Apligraf - a human skin equivalent. Adv Wound Care 1998; 11(4 Suppl): 1-8. 3. Pham HT, Rosenblum BI, Lyons TE, et al. Evaluation of human skin equivalent for the treatment of diabetic foot ulcers in a prospective, randomised, clinical trial. Wounds 1999; 11(4): 79-86. 4. Brem H, Balledux J, Bloom T, et al. Healing of diabetic foot ulcers and pressure ulcers with human skin equivalent: a new paradigm in wound healing. Arch Surg 2000; 135(6): 627-34. 5. Veves A, Falanga V, Armstrong DG, Sabolinski ML. Graftskin, a human skin equivalent, is effective in the management of non-infected neuropathic diabetic foot ulcers: a prospective randomized multicenter clinical trial. Diabetes Care 2001; 24(2): 290-5. 6. Ballard K, Baxter H. Developments in wound care for difficult to manage wounds. Br J Nurs 2000; 9(7): 405-8, 410, 412. 7. West DC, Hampson IN, Arnold F, Kumar S. Angiogenesis induced by degradation products of hyaluronic acid. Science 1985; 228(4705): 1324-6. 8. Vowden K, Vowden P. Wound bed preparation. World Wide Wounds (online) 2002; Available from URL: http://www.worldwidewounds.com/2002/april/Vowden/Wound-Bed-Preparation.html [Accessed May 2002].